Last month in World Net Daily, veteran psychiatrist Doctor Lyle Rossiter published an extensive study in his book, ‘The Liberal Mind: The Psychological Causes of Political Madness‘ which points out that the vast majority of Democrat supporters are in fact, “mentally ill”, and that is what’s really driving the people to eat up the propaganda of the mainstream media’s fake news coverage. 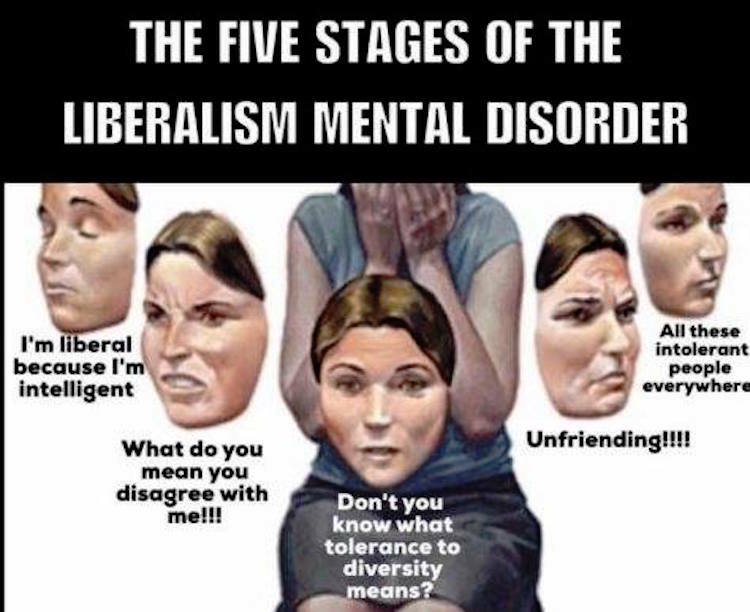 This, as we all know, has also become to be known as ‘Trump Derangement Syndrome’, which is a form of psychosis suffered by leftists, according to Dr. Lyle Rossiter. But in his book, released in October 2011, a long time before the emergence of Donald Trump on the political scene, it outlines undeniable links between the extreme leftist mind state and mental illness, which if you think about the last few years alone, has become so very apparent. It’s almost as if Lyle Rossiter took a time machine to 2016! Obviously, his book is a must read, and it will explain a lot of the implications and symptoms of being a liberal leftist. Since the US election in 2016, many people on the right of politics have expressed this same concern over the liberal agenda in recent years, claiming and stating that some liberals must be mentally ill. Now, we have a veteran psychiatrist who’s spent years in the field of psychiatry backing up those claims, and reiterating these facts that were found in his research which he wrote into his book back in 2011. Dr. Lyle Rossiter has no certain political affiliation, and he wrote the book without any bias, which proves the now very popular statement that, “liberalism is a mental disorder” to be far from just a right-wing conspiracy theory. During his long career as a psychiatrist, Dr. Rossiter diagnosed more than 1,500 patients as a board-certified clinical psychiatrist, as well as oversaw more than 2,700 civil and criminal cases as a board-certified forensic psychiatrist. Dr. Lyle Rossiter also received his medical and psychiatric training at the University of Chicago. Rossiter told WND that today’s liberalism, as displayed by the likes of Hillary Clinton and Barack Obama throughout the previous administration, as well as by today’s Democratic Party and the hysterical mainstream media, can only be comprehended as a psychological disorder. Well, he’s been hitting the nail right on the head of sufferers, without calling out the need for their lobotomy, for quite some time already. In fact, for the many decades that he’s practiced in the field of psychiatry, he’s recently likening “liberalism” to mental illness, so you should most definitely take his word for it, if not for ours. Dr. Lyle Rossiter may even have coined the phrase “liberalism is a mental disorder” many years prior to it becoming more widely used, in order to describe the form and fashion of the current state of the Democrat Party, its supporters, and the agenda perpetuated by the looney bin characters of the mainstream media’s fake news network’s output. Could the agenda of the Democrat Party and the mainstream media be fuelled by the mental illness as it’s core supporters? Well, we now have Dr. Lyle Rossiter’s book to confirm just that, and it’s a riveting read. So by all means, grow your knowledge and purchase his book on the link provided below. Happy reading everyone! Buy ‘The Liberal Mind: The Psychological Causes of Political Madness’ here!